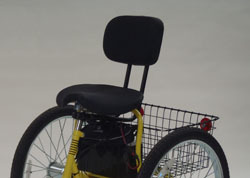 The 24" Commander Electric Trike is for the decisive person about town who leads the way. It may be seen at the Hardware store, the Marina, Sports Shop or the Library. 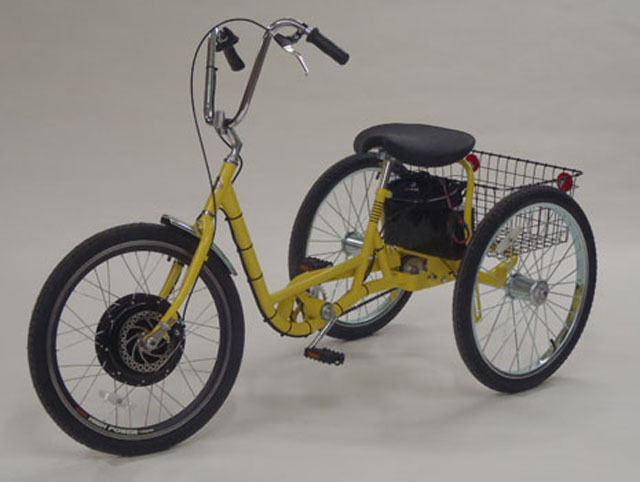 This adult trike comes equipped with a silent 500 watt hub electric motor on the front wheel; twist grip speed controller with zero to 12 mph and a 36V automatic charger, and 36V battery pack. Size: 43" H x 70" L x 29" W. Wt. Capacity 400 lbs. Saddle type seat.